Pikes Peak is a unique mountain that extends up above 14000 feet (known as a fouteener). But you won't be required to hike up to the top. You can drive up to the peak of Pikes Peak. In addition to driving, you have the option of taking a cog train to the top. Below are the highlights of the trip up the mountain. Check the weather to make sure there are optimal weather conditions. If it looks good, plan to arrive to Pikes Peak in the AM hours. If you arrive to Pikes Peak summit in the PM, there is a high chance of clouds and stormy weather. If the weather doesn't cooperate, you will be held at the bottom of until the weather improves. Getting to Pikes Peak is a short drive from Highway 25. Once you get to the park entrance, where you pay an entrance fee per person, it's a one way road to the top (and back down). The drive up Pikes Peak is scenic, so take the drive slowly so passengers can enjoy the view. The driver should keep their eyes on the road, as it does extend close to the edge of mountain and some sections do not have guard rails. You'll want to keep your AC off to prevent overheating, but this is easy as the temperatures drop quickly as you gain elevation. You can also pay extra for a ticket via the old Cog Train. Via the Cog Train, it'll take about 1.5 hours. Additionally, you will be tied to the schedule of the Cog Train when you want to head back down. Though I didn't take the Cog Train, I did see one arrive and the it was fully packed! One of the first things you may notice as you begin walking around the summit of Pikes Peak is a lightheaded feeling. This is due to the thinner levels of oxygen at higher elevations. 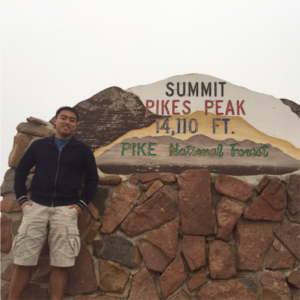 What to do at the top of Pikes Peak? At the peak of Pikes Peak, there is a look out area plus a gift shop. The famous selling point is to eat a donut up at 140000 feet. If the weather becomes uncooperative (lightening and thunder), you may want to take shelter. It's not uncommon for people to be struck by lightening. The drive down should be done on low gear. As you exit the park, they will take the temperature of your brakes to ensure safe travel down the remainder of mountain. Overall, this is an amazing place to visit. The fact you can drive non-hikers up to the top of the mountain is a rare experience for everyone. I recommend visiting Pikes Peak if you're in Colorado Springs. If you're coming from Denver, you have a choice of either visiting Pikes Peak or Mt Evans (the road to the top was closed due to landslides when I visit, but this is the highest paved road in North America).